As the number of not-for-profit organizations responding to societal needs has grown, community based organizations have become more decisive in determining the health and well being of impoverished individuals and families. With the persistence of poverty, coupled with rising economic inequity, the social economy presents a new way of thinking about how to catalyze community projects, programs and organizations in order to generate greater economic security and promote the well being of groups, individuals, and communities most vulnerable to social and economic risk. By working together with the public sector and community advocates, community based social enterprises can be innovative forces in the struggle to curb both social and economic marginalization, and in some cases reverse the cycle of poverty and social exclusion. Such enterprises foster creative solutions to common problems, and work together with civil servants, community leaders, and citizens to build networks and institutions to foster healthier, unified and sustainable communities. This page outlines the role of the social economy in generating high quality services and what can be done to further their contribution to progressive social policies, project, and community objectives. Social Cooperatives and Hybrid Service Organizations highlights the role social enterprises have in poverty reduction, and details the different ways they serve and engage communities. Contracting with the Public Sector covers issues related to the role of non-profits in government contracting and how social enterprises can engage in partnerships with public agencies, civil servants, and local and federal entities engaged in promoting and generating human services for the public good. Asset Building gives resources and information for impoverished families and communities on ways to generate and invest capital to realize community objectives. Assessing Social Value addresses innovative ways in which policy makers and community groups are grappling with efficacy and accountability in measuring the benefit of social programs and services. Though not initially conceived as a mechanism to reduce poverty, cooperatives have demonstrated the ability to provide a safety valve for vulnerable populations through public service. Johnston Birchall in the ILO publication Rediscovering the Cooperative Advantage: Poverty Reduction Through Self-Help, states that cooperatives can favor those who are suffering inequity and are economically marginalized. Cooperatives offer membership shares at relatively low-costs and enfranchise individuals in need of employment and financial stability. Cooperative values are attuned to serving its members, investing training and skill development among workers. These values also extend to serving communities of which cooperatives have a responsibility to. Policy and regulation is a major influence in the effectiveness of social cooperatives, as demonstrated in Italy, Canada and the UK. With government legislation such as law 381 and 391 supporting cooperative activities, social cooperatives in Italy have grown dramatically over the last decade so that today there are over 7,000 operating nation wide. These organizations are geared toward providing social services such as health care and provide training and employment for the economically disadvantaged. These cooperatives create arraignments with local governments to take on the bulk of needed services, easing burden on the state and having communities more engaged in how their infrastructures operates. Cooperatives are a useful tool in combating poverty because it addresses the issue of social exclusion, a common aspect in condition of poverty. Looking at four case studies in Quebec, Canada Girard and Langlois assessed solidarity cooperatives on their social cohesion. They found cooperatives that could not only serve its locality, but nearby ones as well. The communal membership and easier access to services for consumers formed a strong support network and sense affiliation. Cooperative child-care and preschools offer a way for parents to be more involved in the early social and educational development of their children. Parents in a locale collaborate on a program based on reciprocation where everyone contributes taking care of the children in a community. Such a models are non-profit being based on trust and the betterment of the children. The California Center for Cooperative Development provides an excellent overview of how to develop a Child Care or Preschool Cooperative and its various forms. Knights Landing Children’s Center was opened in 2005 with the efforts of community parents, the local elementary school, the school district, the local Family Resource Center, and current staff of the California Center for Cooperative Development. Today, the Parent Cooperative Center continues to provide quality child care and preschool experiences for community children ages two to six. With government programs put increasingly in a bind in the area of sick and elderly care, many urban areas have developed cooperative care homes to meet the demand for service and create opportunities in the caregiver field. Employees are given thorough training and adequate hours with their responsibility as a company shareholder. This in turn provides clients with caregivers that are knowledgeable and highly devoted. Cooperative Home Care Associates in the South Bronx provides clients with quality care by paraprofessionals highly trained and motivated. Amherst Wilder Foundation has a community service for the aging program that strives to provide the ill and low-income elderly of the St. Paul, MN area with care that enables them to live healthy, independent lives. Cooperative Care provides home care to elderly persons and persons with disabilities while allowing low-income members of the community to essentially run their own business. Cooperative Care received a grant from CDF’s Mutual Service Cooperative Fund. Another human service that the social economy is closely involved in is self-sustaining income for the homeless and underemployed. This transition into the workforce for the disadvantaged involves effective training programs that secure permanent placements, and building workplace skills for those with little or no experience. By empowering individuals with skills and responsibility they can climb themselves out of the depths of poverty. CAUTO: Social Cooperative for Work Integration details the cooperative classifications in Italy and how they specifically accommodate employment for disadvantaged individuals. WAGES works with low-income immigrant Latinas to launch green business cooperatives in Los Angeles. We Can Do It is a work integration cooperative partnered with the [Center for Family Life in Brooklyn to create living wage jobs in safe environments, social supports and educational opportunities for its mainly immigrant women members. Real Change is a social justice news organization that runs a blog and a newspaper publication, employing Seattle&amp;quot;s homeless to sell issues, giving them re-entry in the workforce. Getting to Work: ICA’s Social Purpose Staffing Companies is a piece by New York Times acclaimed author Susan Eisenberg that take a close look on three social purpose staffing companies on how they financially operate and network. The Family Van is a mobile health clinic affiliated with Harvard Medical School that serves at-risk underprivileged clients in a cost effective and efficient way. 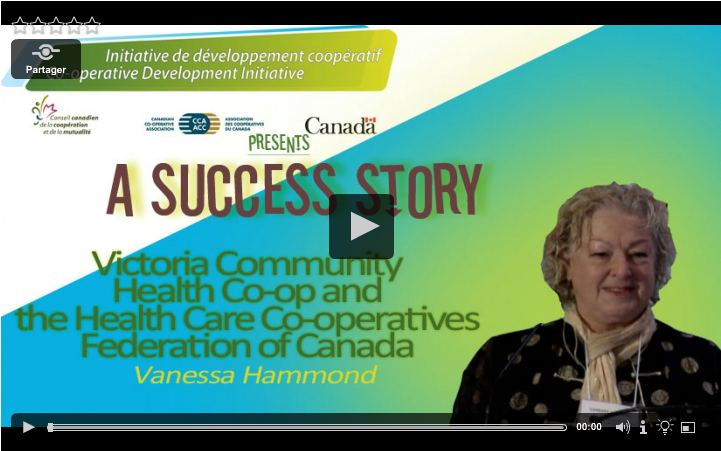 This video highlights Vanessa Hammond of the Victoria Community Health Co-op and her presentation at The Co-operative Development Initiative 2011 conference. She speaks about the creation and maintenance of this co-op as well as her experiences with the Health Care Co-operatives Federation of Canada. Brandson, T. Dekker, P. & Evers, A. (2010). Civicness in the Governance and Delivery of Social Services. Germany: Nomos Verlagsgesellschaft. Maloney, W. & van Deth, Jan. (2008). Civil Society and Governance in Europe. UK: Edward Elgar Publishing. Perez-Diaz, V. (2009). Markets and Civil Society. New York, NY: Berghahn Books. Kurimoto, A . (2005). “What Can Co-operative Health and Social Care Offer?” Ch. 19 in Tsuzuki, C. et al. (eds). The Emergence of Global Citizenship: Utopian Ideas, Cooperative Movements and the Third Sector. Tokyo: Robert Owens Society of Japan. Morais, L. & Fonteneau, B. (2010). “Social and Solidarity Economy: Building a Common Understanding.” The Reader 2010. Turin, Italy: International Labour Organization. HealthPartners: The largest consumer-governed, nonprofit health care organization in the nation, HealthPartners provides care, coverage, research and education to improve the health of our members, patients and the community. Global Health Cooperative: Group Health Cooperative is a consumer-governed, nonprofit health care system that coordinates care and coverage. Founded in 1947 and based in Seattle, Wash., Group Health and its subsidiary health carriers, Group Health Options, Inc. and KPS Health Plans, serve more than 600,000 residents of Washington state and Idaho. Shriver Law: The National Center on poverty law works to achieve social and economic justice for those in communities in need. Policy change is targeted at the state and federal level and focuses on human rights and equal opportunity. National Center for Law and Economic Justice (NCLEJ): a legal advocacy group with roots dating back to the Civil Rights Movement, NCLEJ has worked in various economic justice issues relating to human services and income dispensation. Southwest Collaborative on Immigration Inequality and Poverty (SCIIP): a collaborative research center for both university and community researchers to investigate problems relating to immigration and poverty in the Southwest. International Policy Center on Inclusive Growth: a program of the UN that researches policy changes, trains policy makers and networks individuals that aim to improve conditions in the developing world. Institute for Research on Poverty (IRP): an inquiry center that looks into the cause and effects of poverty in the US. Center for Urban Poverty and Community Development: researches the conditions of low-income urban areas in order to find solutions to alleviate existing inequities. Center for Law and Social Policy (CLASP): a non-partisan advocacy group that researches and lobbies to influence policies at the federal, state and local level that improve the lives of low-income communities. Poverty, Race and Inequality Program at Northwestern University: studies the causes and consequences of economic and social inequities. Comparative Research Programme on Poverty (CROP): presided over by a scientific committee that coordinates cross discipline activities and networks that research poverty and seek adequate policy solutions. Manpower Demonstration Research Corporation (MDRC): a creation of the Ford Foundation that evaluates existing low-income relief policies in education, housing and employment in order to establish efficiency in funding and programming. American Public Human Services Association: a bipartisan non-profit organization that operates around the U.S. conducting research, identifying best practices and reviewing policies all regarding citizen health and wellness. While social economy organizations are separate entities from the public sector, as seen in cases in Europe, they increase their ability to serve communities when government policies allow for their expansion and work in conjunction with broader efforts aimed at serving the public good. The increased demand for social and health services, particularly for children, youth, the elderly, the disabled and the long term unemployed has seen non-profits step in for the public sector by delivering quality service. While this process often leads to an off-loading of public responsibility for common community issues, it is important that the public is aware of this issue and engaged in making sure that institutions and procedures are put in place that strengthen the positive role that social economy organizations can plan within emerging welfare networks and community development more broadly. Housed with the Obama Administration’s Domestic Policy Council, the Office of Social Innovation and Civic Participation (SICP) is tasked with engaging individuals, non-profits, the private sector, and government to foster innovation and work together to make greater and more lasting progress on our nation’s challenges. The office is focused on doing business differently by promoting service as a solution and a way to develop community leadership; increasing investment in innovative community solutions that demonstrate results; and developing new models of partnership. SICP’s Community Solutions Initiative focuses on three mission areas that comprise a bottom-up, innovative, and results-oriented “community solutions” agenda. To deliver on this agenda, it marshals the power of service, social innovation, and partnerships to solve our most pressing challenges. This page serves as a place to learn more about initiatives the Administration is embarking on that reflect each of the Office’s mission areas. While each initiative is listed under a mission area, many are crosscutting, including elements of two or all three of the mission areas. The Office of Small and Disadvantaged Business Utilization (OSDBU), located within the U.S. Department of Housing and Urban Development, is responsible for ensuring that small businesses are treated fairly and that they have an opportunity to compete and be selected for a fair amount of the Agency’s prime and subcontracting opportunities. The department also has a page for learning how to become a contractor, getting involved with HUD programs, and additional resources of potential use in educating, marketing and funding for social enterprises. The U.S. Small Business Administration (SBA) has advisory web pages for women, veterans and Native Americans wanting to engage in entrepreneurship. The National Women’s Business Council (NWBC) is a bipartisan advisory group that conducts research and creates networks to inform policy-makers in the federal government of important economic issues for female business owners. One of their projects is a website designed to assisting women in getting their businesses federally certified for contractors. Minority Business Development Agency (MDBA) funds networks of centers assisting minority entrepreneurs that provide training, avenues for capital and other business needs. Pima Association of Governments is a nonprofit metropolitan planning organization that works with local governments, the Arizona Department of Transportation, the Arizona Department of Economic Security (DES), community agencies and interested citizens in developing plans and recommendations for the allocation of federal Social Services Block Grant (SSBG) and other federal, state and local funds for human service’s needs. The SSBG plan directs funding to programs and services that help address the social services needs of children, youth at risk, families in crisis, low income individuals, homeless, elderly and persons with disabilities. The National Council of Nonprofits notes that while governments now rely extensively on nonprofit organizations and social enterprises to deliver human services to their most vulnerable residents, government’s do so using a contracting system that is flawed and greatly in need of reform. The following web portal created by the council explains the nature of the problem and how the government contracting system can be repaired. Sections 10 and 12 offer information on which ways the public sector can promote and develop social enterprises through a variety of opportunities but also considers the risks and responsibilities of engaging in these contracts. Sections 13, 14, and 15 has advice for social enterprises pertaining to these different laws and the risk assessment and careful planning they should take to avoid finding issues in these areas. Achieving Community Benefits Through Contracts: Law, Policy and Practice, is an extensive guide developed by Richard Macfarlane and Mark Cook from the Joseph Rowntree Foundation, which details ways of including community benefit requirements – such as creating new job and training opportunities – in procurement contracts, partnership agreements, funding agreements and planning agreements. It focuses on employment, training and regeneration, but the findings also apply to other community benefits. Although developed for the United Kingdom and European Commission legislation, it has relevance for contract laws and policy for the United States government. Some of the issues it discusses include government procurement policy, discrimination issues, partnering, voluntary agreements, funding agreements, and land contracts. For many living in poverty, the condition is chronic. Families lose the ability to support themselves and must divert all resources and earnings to meet ends meet. A way out of the cycle is asset building, where individuals and communities collect, enhance and maintain all types of assets whether they are financial or other. By providing initial support for impoverished groups, these communities can gradually get on the path of financial independence. National Community Tax Coalition: a membership organization of community organizations that provides tax and accounting services for low-income areas. Assets for Independence (AFI): a program that provides enabling grants to community non-profits to help impoverished areas out of poverty. Mckernan, S. (2008). Asset Building and Low-income Families. Washington DC: Urban Institute Press. Retsinas, N. (2005). Building Assets, Building Credit: Creating Wealth in Low-Income Communities. Washington DC: Brookings Institution Press. Shapiro, T. (2001). Assets for the Poor: The Benefits of Spreading Asset Ownership. New York, NY: Russell Sage Foundation Publication. Recently social policies and programs are being reassessed in their contribution to communities. Government and NGOs are implementing new areas of research that not only evaluate what communities’ need, but if existing activities are meeting those needs. Assessing social value is an introspective act for social enterprises to gauge effectiveness and increase efficiency. In 2010, the Obama Administration released a document examining standardized performance metrics for national service programs. It has several performance measure criteria, definitions and calculation methods that social enterprises can use to effectively evaluate their business with the goal of enhancing accountability and ultimately provide successful outcomes. A basic overview of social program evaluation is provided by the Burns Owens Partnership that goes over different ways to measure efficacy. Students at ASU can participate in the Community Action Research Experiences (CARE) program. This educational initiative from the School of Social and Family Dynamics has students of any discipline, under the supervision of faculty, work with community partners in assessing their social policies and programs through research. Gonzales, V. (2008). “Social Cooperatives and Empowerment: Assessing the Value-Added for the Citizen Consumer.” Working Papers, n. 31, ISSAN, Universita degli Studi di Trento. Trento, Italy.